Home / videos / Bypass Nokia 6.1 FRP Lock On Android Pie V9.0 Without Pc/Without Talkback. 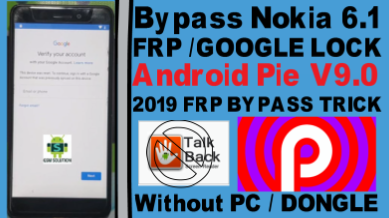 Bypass Nokia 6.1 FRP Lock On Android Pie V9.0 Without Pc/Without Talkback ? 1# Download Quickshortcut Maker Apk file. 2# Download Google Account Manager V9.0. Bypass Nokia 6.1 FRP Lock On Android Pie V9.0 Without Pc/Without Talkback Method? 2# Now change language like video. 3# Go to Keybord setting. 4# Just followed Step by step like video. 7# Now google crome willbe opend. 8# Go to my site Gsm-solution.com. 9# Download Google Account Manager V9.0 and install it. 10# Again download Quickshortcutmaker apk file then open it. 11# Go to google account login. 12# Now login new gmail id and password. 15# Go to setting and enable developer options like video. 17# Now reset your phone like video. 18# Few mins waiting in process. 19# Now your phone open normal mode click next step by step. 20# Now your All nokia frp bypass complite.